When I buy a collection pack of paper, I usually have some scrapbook pages in mind. After those pages are finished, the scraps and left over papers are free for cards. 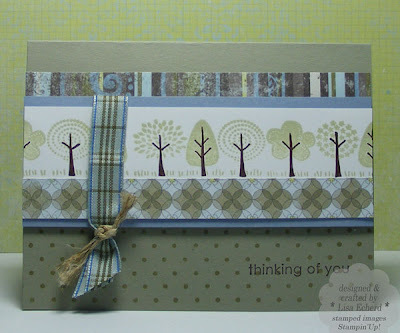 The designer papers on this card are from Basic Grey's Periphery collection which were nature colors for many of our travel pages for 2009. Most of the papers in that collection were large designs or collage type images that would be difficult to use on cards particularly if you want to make multiples. These two papers are the exception though they still require some creative cutting to keep from looking too distressed for the stylized trees. I love the ribbons that came with this collection. The trees were made with the Funky Forest wheel. I rolled them in Certainly Celery. Then I took a Chocolate Chip marker and colored over the trunks and branches. Tying off the ribbon with twine uses less ribbon, adds interest and makes a flatter card for mailing than knotting the ribbon itself. This is one of the cards we are dong in card class this Saturday for Sympathy and Thank You cards. Hope you have a great week! Thanks for visiting. Ink: Dark Moss fluid chalk by Colorbox; Certainly Celery and Choc Chip by SU!